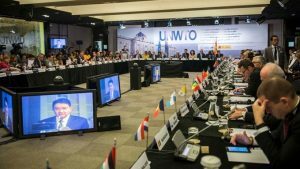 Madrid (Spain) – May 16, 2017 (travelindex.com) – Madrid, Spain, hosted the 105th meeting of the Executive Council of the World Tourism Organization (UNWTO) between 11 and 12 May. The Meeting focused on current trends and challenges facing the tourism sector and on the three priorities of the Organization – safe, secure and seamless travel; the impact of technology in the tourism sector and sustainability. The Executive Council is UNWTO’s governing board, responsible for ensuring that the ‎Organization carries out its programme of work. It meets at least twice a year and is ‎composed of 33 members elected by the General Assembly in a ratio of one for every ‎five Full Members. As host country of UNWTO’s Headquarters, Spain has a permanent ‎seat on the Executive Council. Representatives of the Associate Members and Affiliate ‎Members participate in Executive Council meetings as observers.